The new Brothers-All-Natural website was designed using real-time input from their Facebook fans. This new website allows for easier online shopping. All-Natural 100% Freeze-Dried Fruit provides an extremely convenient way to get the recommended daily five servings of fruit. The Facebook-powered Focus Group permitted Brothers-All-Natural to glean highly valuable input virtually in real-time. Families dealing with food allergies or other dietary restrictions find that Brothers-All-Natural Fruit Crisps solve a lot of their shopping dilemmas. Brothers-All-Natural Fruit Crisps are preservative-free and additive-free; contain no peanuts, tree nuts, gluten, soy or dairy; are not genetically modified or engineered (non GMO); plus they are vegan and OU-certified Kosher. The single-serving bags are great for on-the-go snacking, as each bag contains two (2) servings of fruit. With Brothers-All-Natural Fruit Crisps you get 100% fruit that is convenient and affordable, making it very easy to get your recommended five (5) servings of fruit per day. Brothers-All-Natural is proud to announce the launch of their brand new website at http://www.BrothersAllNatural.com. This highly intuitive and aesthetically pleasing website was designed specifically with their customers in mind. Dozens of consumers participated in a Focus Group and were surveyed afterward regarding their input concerning the new website prior to the website’s official launch. These participants were obtained through the Brothers-All-Natural Facebook page, and each was given a 22-question survey after previewing the website at their leisure over a 3-day period. The Facebook-powered Focus Group permitted Colin Chase, the new Director of eCommerce for Brothers International Food Corporation (the parent company of Brothers-All-Natural), to glean highly valuable input virtually in real-time. Chase is an advocate for listening to customers and cutting through the corporate mindset to hear the core of actual customers’ concerns. This attribute allowed Chase to fit right in at Brothers-All-Natural. The company plans to continue making customer-driven changes by conducting frequent website testing, and then modifying the site based upon the insights they obtain. For many years Brothers-All-Natural has been providing America with the leading freeze-dried fruit products in the market today. With the new website, the company plans to continue providing their products to the country from a highly intuitive and customer-driven eCommerce platform. 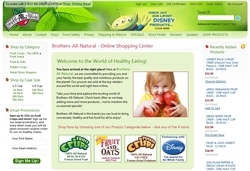 To learn more about Brothers-All-Natural or to make a purchase visit them online at http://www.BrothersAllNatural.com. Brothers International Food Corporation is a privately owned food and beverage company based in New York with offices in North Carolina, China and Ecuador. The company was founded in 2001 by brothers Matt and Travis Betters, whose family was involved in the processed fruit and vegetable industry for more than 65 years. In addition to supplying top-quality fruit and fruit juice concentrates to a number of Fortune 100 food companies, Brothers International is the parent company of Brothers-All-Natural, producing all-natural 100% fruit that is freeze-dried, as well as potato Crisps, and Lost Vineyards, importing low-cost wines from little-known vineyards in Europe and South America. For more information, visit http://www.brothersinternational.com.